An increasing number of timing belt transmissions are used in transport and conveying technology, also for precision positioning. Especially with complex handling and positioning operations which, in addition, require maximum precision, optimized elements such as the new polyurethane timing belts BRECOFLEX® StandardPlus can manifest their strength. Brecoflex StandardPlus represent an optimized new generation of polyurethane timing belts uniting high power transmission and rigidity, improved running behavior and high precision. Due to decisive changes within the production technology, the consistency of the tooth spacing of a timing belt could be substantially improved and lateral run-off forces almost fully eliminated. 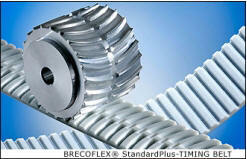 Positive effect: Brecoflex StandardPlus timing belts with their closed tension member winding perform with even more precision and smaller friction losses on the pulley flanges. In particular with wider belts, it is the reduced run-off tendency which simplifies guidance for a centered run. For certain applications, this feature helps reducing the number of flanges required for a drive and, as a result, saving costs. With an almost unrestricted flexibility in lengths, the Brecoflex StandardPlus reaches a precision comparable, for instance, with moulded timing belts. The new generation of timing belts is available in the majority of belt lengths of identical quality. Due to availability of endless coiled StandardPlus belts, now applications in the positioning technology are also possible at low cost which until now have been reserved almost exclusively for other drive concepts.